We are on a journey along the Seven Ancient World Wonders and today we arrive at the Mausoleum of Halicarnassus.Another not so easy prompt I think, but we have said A so we have to say B too. The Mausoleum of Halicarnassus is a monumental grave located in the southwest of Turkey in the city of Halicarnassus (nowadays Bodrum) where lived the king of Carie named Mausole. He was also satrap (governor) of the king of Persia, to whom the Carie belonged. 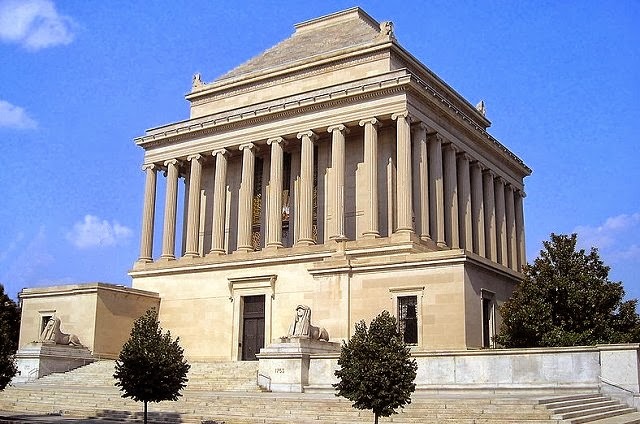 It is very likely that Artemis, sister and woman of the satrap of Carie began the construction of this edifice in 353 BC, three years after the death of king, to honour him. The mausoleum was ended one year after the death of this woman. With a total height of around 43 m (141 feet), it was sustained with thirty six columns and surmounted by a pyramid decorated of one quadriga with marble. The funeral chamber doubtless contained the graves of Mausole and Artemis. We could also observe a valuable frieze represented a fight of the Greeks against the Amazon and the Centaurs. This monument was partly destroyed, by an earthquake, at around fourteenth century. A short time later, the knights of Malta decided to build a fortress: they used the stones of the mausoleum and in 1522, no one remained. Nowadays, we can again observe this fortress in Bodrum. This mausoleum was classified as a wonder because it distances itself by its beauty and its great value. Indeed, the ornaments of the sanctuary were realized by the most famous artists of its era: Satyrus and Pythius for the architecture; Scopas, Timotheos, Bryaxis and Leochares for the sculpture. The decorations and the sculptures were really magnificent. Several pieces were recover and can be seen in the British Museum of London. This prompt will stay on 'til October 26th 11.59 AM (CET) and I will post our next stop on our journey along the Seven Ancient World Wonders, Colossus of Rhodos, later on today around 7.00 PM (CET). !! Mausoleum of Halicarnassus is open for your submissions at 7.00 PM (CET) !! Hi Kristjaan and fellow haiku wanderers - I read the comments on yesterday's prompt page with interest. My participation recently has been less than I would like but not necessarily because of the prompts. (Other life events have interfered with my participation) That being said,I have some comments to make about the conversation from yesterday. For me, these prompts ARE more difficult but I agree with Lolly - at least for me, the poem must come from an aha moment -not easy when one has never met Artemis or seen Zeus or the Greek ruins. So, my way of responding to the prompt, like Lolly suggested, is to free associate. This often takes me far from the prompt and I can tell by some comments that some of you think I'm off the prompt completely. No matter. It is the poem that matters, not the prompt. In my case this takes much concentration and time. In the past few days I have been sorely lacking in both of these, hence my non-participation! When my life allows, I shall return! Good day Wabi ... I have to agree with you that haiku describes a 'aha'-erlebnis and that's what haiku means to do. However ... I think that every post, for sure these about the World Wonders, can be a source for inspiration to write haiku ... it 'triggers' the mind to write haiku by association, as we do for example with our Tan Renga Challenge. But ... there's more then writing haiku and sometimes things in your (or my) life need also our attention. So don't worry about it ... just have fun in writing haiku. As you said yourself the prompt isn't the important thing here at Carpe Diem ... and sometimes you've to take a complete different path then the prompt suggests. Carpe Diem is wonderful, but it can't be an obligation to write every day haiku ... that's what my goal is ... just bringing haiku under the attention of the world, because it's a beautiful poetry form and I am 'strongly in love with haiku' ... take your time ... but I hope to see you here again. You will be missed. I fully agree that we have to go way beyond the prompt to find that haiku moment... I'm behind reading comments now... but what I have seen so far is that a difficult prompt generates thinking out of the box, and better poems. It has been a busy week, and my engagement in dVerse takes a lot of my poetry time. Still I want to really challenge myself every day here..
That said the aha can come from reading articles on wikipedia or from the own experience.. it's all personal... I will read more later today.